MEMORIAL DAY, IN REMEMBRANCE . . . Cemetery, The Presidio, San Francisco, California. Photo © Jim Doty, Jr.
Memorial Day began unofficially in a variety of places as people felt the need to recognize those who gave their lives in the Civil War. Memorial Day was officially declared on May 5, 1868, when General John Logan of the Grand Army of the Republic ordered a day of observance when all Union and Confederate Graves at Arlington National Cemetery would be decorated with flowers on May 30, 1868. One state after another adopted May 30 as a Memorial Day observance until all of the Northern states had adopted May 30 by 1890. Many Southern states had picked different days to honor the Confederate dead. 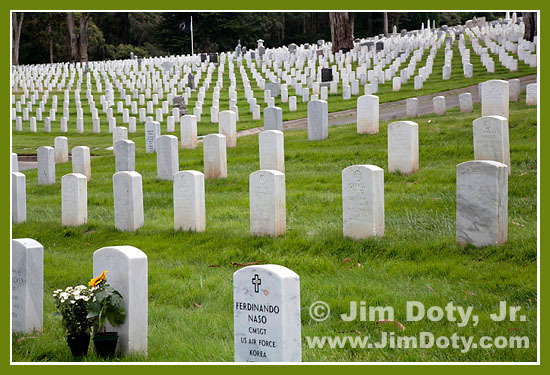 After WWI, Memorial Day became a day of observance for American soldiers who died in all wars, not just the Civil War. In 1971, congress changed the date from May 30 to the last Monday in May as part of a three day weekend for federal employees. Most states follow the same day as the federal observance. In 2000, congress declared a “National Moment of Remembrance” at 3 pm local time on Memorial Day when all Americans can remember “To voluntarily and informally observe in their own way a Moment of remembrance and respect, pausing from whatever they are doing for a moment of silence or listening to Taps”. If you are one of the American readers of this blog, take a moment on Memorial Day to remember those who gave “the last full measure of devotion”. WHERE HAVE ALL THE LEADER’S GONE? Excerpted from WHERE HAVE ALL THE LEADER’S GONE? by Lee Iacocca (highly respected business leader and former Chrysler CEO) with Catherine Whitney. Learn more about Lee Iacccca at Wikipedia. Stay the course? You’ve got to be kidding. This is America, not the damned Titanic. I’ll give you a sound bite: Throw the bums out!